Pilates is a superior method of exercise, flexibility and strength. Because of its emphasis on correct positioning for effectiveness, it is always recommended to begin Pilates training with in-person classes under the guidance of a well-trained Pilates teacher. Pilates instructors are specially trained to evaluate and correct body alignment and positioning so that exercises are effective for strength, balance, and flexibility. After learning the correct positioning with an instructor, however, there are several advantages to continuing your Pilates training and practice with DVDs and other Pilates videos. With videos, you can work out at home whenever your schedule allows. Parents of young children don’t have to miss a workout when they don’t have child care for any reason. They can even work out as their children sleep or play nearby. No more missed workouts when kids are sick or just having a bad day. 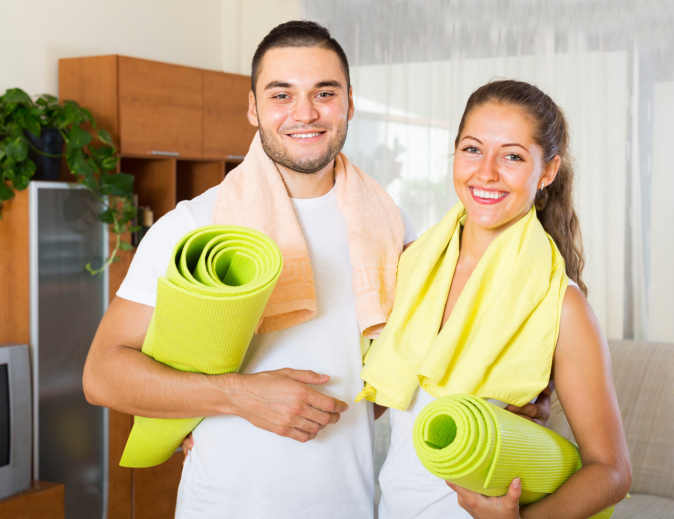 Another advantage of at-home workouts is that you can practice the same Pilates exercises and positions over and over again without paying to take the same class repeatedly. DVDs can supplement a once or twice a week class, providing the repetition needed to become proficient and increase your strength. At-home workouts are also great for those areas that don’t have a Pilates studio within a comfortable driving distance. Pilates Sports Center offers several DVDs, both stand-alone and series, that can provide a quality workout in your home when you can’t get to a studio. Many of these offerings are unique and meet special needs of some part of the Pilates community. DVDs vary in intensity from beginner to advanced, and all demonstrate correct positioning by a trained Pilates instructor. ENJOY 30% OFF OUR DVD DIGITAL DOWNLOAD LIBRARY FOR THE MONTH OF JULY! Use coupon code: jul30 at checkout! Developed by men, for men, this series is available as a 3-disc set or as individual workouts on the mat, with bands, and with a ball. These DVDs take men from beginner to intermediate level workouts that will transform their bodies in as little as 60 days with the principles pioneered by Joseph Pilates. This series of 3 DVDs uses the Jump Board on the Reformer apparatus to give users a blend of cardio, resistance training and core work. Differing levels of intensity are demonstrated so that beginners and more advanced practitioners can both benefit. This mat-based routine incorporates a foam roller to provide a great foundational workout for both men and women from beginner to advanced levels. Both cardio and resistance training are included. For women who deal with the hormonal shifts, aches and pains that come with PMS, this unique, gentle workout can be a way to restore proper alignment to the body and release tension. This intermediate workout is not for the faint of heart! 8 fast-paced exercises will help you not only strengthen your core, but get your heart rate up to burn calories as well. These and other videos including the PSC exclusive Burn at the Barre series will keep you in top condition when you can’t get to the gym. Find more information about all of PSC’s DVDs here. Instant streaming options are available, so you don’t even have to wait for items to ship to you. ENJOY 30% OFF OUR ENTIRE DIGITAL DOWNLOAD LIBRARY FOR THE MONTH OF JULY! Use coupon code: jul30 at checkout!